Chris posted this weekend about his experiences at Maker Faire, and the idea of STEAM instead of STEM. 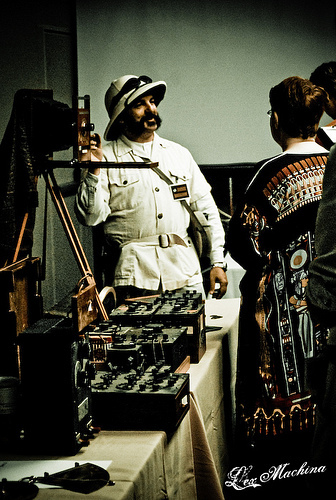 On my own blog, I’ve talked a bit about my involvement in the steampunk community. (No idea what steampunk is? Check out Girl Genius for an example) Generally, at least in my region, it’s a group with backgrounds predominantly in visual art, music, theatre and literature, but with a strong interest in science and engineering. However, in many cases, they never got into science in school. So why do I care about outreach to the arts? Well, I find it hard to resist an interested audience that will let me lecture at length and asks great questions. I also care because science literacy is important for everyone, and if it’s in the context of dirigibles and boiler engines, so be it. By being able to put information in context, it becomes more interesting to your audience. Why would your character be wearing goggles? Why are you making props out of brass, leather and wood? Artists are incredibly interested in materials, and the limits of what you can achieve with them. I also think this kind of outreach is actually a great way to reach the K-12 set. It takes science out of the classroom, and connects it to something they’re already interested in. As Chris was discussing earlier this week, science and engineering are about ingenuity and creativity. But if you think back to you science classes, how much was that emphasized? What non-engineering hobbies do you integrate engineering into? I’ve found that most kids in K-5 really like metrology if you teach it right. It makes a great STEM lesson, incorporates some nice history, and has plenty of hands-on and problem solving. Add to that all the awesome looking measuring implements from the early 20th and late 19th century (precision balances, planimeters, vernier and dial calipers) you can usually spark some real interest.